Sitting about 2 feet away from where I write is my writing buddy - Kiwi. Kiwi is an African Senegal Parrot who sits in her cage beside me and watches me type all day. I decided it was time to give Kiwi credit where credit is due - she keeps me company while I write and is quiet most of the time - but always right there if I need a break. Oh, and did I tell you she can talk? Kiwi has been a part of our family for about 8 years now and was only 6 months old when we got her. She's even a little bit famous. Her picture appeared in an issue of Bird Talk magazine a few years ago. So few people owned African Senegals then that they were in need of photos for an article - so Kiwi was picked. A little about African Senegals: They are a little bigger than a Cockateil and a lot smaller than an African Grey. Here in America, they are bred and sold as "Exotic" birds. In Africa, they are known as pests. They live in Western Africa and tend to pester the farmers eating their corn and millet. But here, we pamper them and treat them like royalty and, in return, they become quite attached and eager to please. Although Kiwi is technically my daughter's bird, I'm the one who sits by her all day so she seems to favor me to. It helps that my daughter and I have the same sounding voice, I think, too. All day, Kiwi plays in her (large) cage, sits by her mirror and primps, sleeps, and part of the day, stands in the corner nearest to me, waiting for me to acknowledge her. She is so quiet most of the time, I sometimes forget she is even there. But when she gets bored waiting for me to talk to her - she quietly says, "Hi", to get my attention. Unlike what some people would have you believe, parrots do not learn the words you try to teach them, they learn the words they find interesting. By the little exchange above, you can tell there were times her screeching became too much and we'd tell her "You're annoying!". After she started saying that, we'd reply, "No, I'm not." After she learned to say that we replied "Yes, you are." Well, you can see where that got us - now she does it in sequence and it is hilarious - no we didn't mean to teach her this - she picked it up fast! Luckily, she says a lot of other, nicer things. (And thank goodness, she doesn't swear!). Her favorite way to get attention is a sweet, soft "Hi." Her other words are, Kiwi, Kiwi bird, pretty bird, love you, baby bird, Hi Kiwi, (she calls everyone Kiwi), and a bunch of other words I can't think of right now. She very expressive - when my daughter rounds the corner to come into the house and Kiwi sees her outside the window she cries happily, "Hi, Kiwi". She has her special whistle when we are about to leave the house, too. My husband used to stand at the door and whistle for the dog to come in and Kiwi learned that whistle. Now, when we go out the door, she does her "dog" whistle. Sometimes, when she sees me putting on my coat and grabbing my purse - long before I get to the door, she will start her good-bye whistle. Honestly, no one can tell me these birds are not intelligent. So, Why is Kiwi My Writing Buddy? Kiwi keeps me company much as a dog or cat does while I'm working. (Oh, I have cats too and they all love Kiwi.) 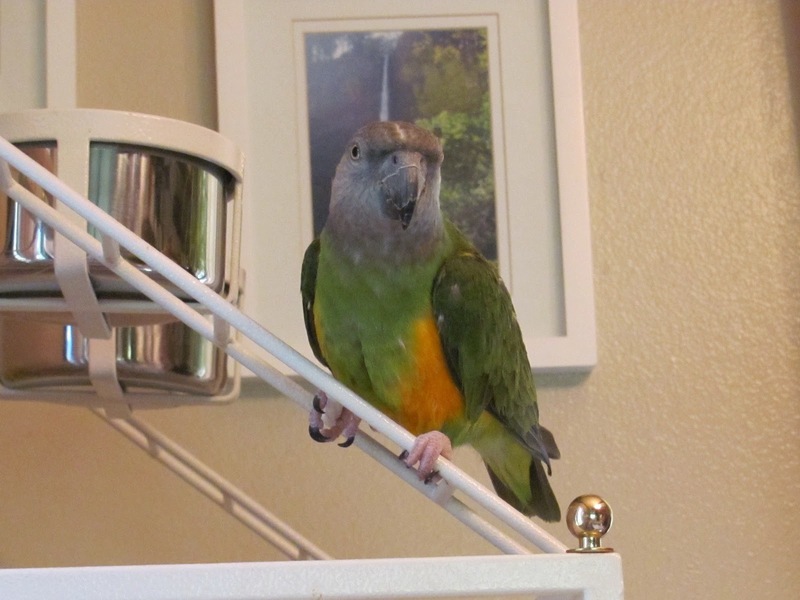 When I get stuck with my writing, all I have to do is turn to Kiwi and say Hi and she comes running across the cage to see me - much like a dog would do. Other times, she breaks up the monotony of working by getting my attention and talking to me. She makes me laugh and sometimes she even give me kisses (little kissy noises she makes) when she wants to send her love. So I will officially make her my writing buddy, much like my dog is my walking buddy. She makes my writing life just a little more interesting. Of course, there is also the cat who, in the middle of my writing, jumps up on the table and lays his head on my laptop keyboard wanting attention - or maybe wanting to help with my writing - but that's another post. Do you have a pet who keeps you company while you write?